The Orchard Project site contains additional information including documentation and walkthroughs. The ability to create a composite solution based on a collection of modules is a compelling feature. In Orchard, these modules can just be created as simple MVC Areas or they can also be created inside of stand-alone web application projects. 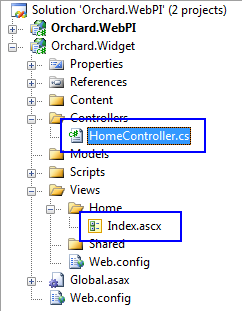 The walkthrough for writing an Orchard module that is available on the Orchard site uses a simple Area that is created inside of the host application. It is based on the Orchard MIX presentation. This walkthrough does an effective job introducing various Orchard concepts such as hooking into the navigation system, theme/layout system, content types, and more. However, creating an Orchard module in a separate project does not seem to be concisely documented anywhere. Orchard ships with several module OOTB that are in separate assemblies – but again, it’s not well documented how to get started building one from scratch. The following are the steps I took to successfully get an Orchard module in a separate project up and running. Step 1 – Download the OrchardIIS.zip file from the Orchard Release page. Unzip and open up the solution. Step 3 – Add assembly references to Orchard.dll and Orchard.Core.dll. Step 4 – Add a controller and view. I’ll just create a Hello World controller and view. Notice I created the view as a partial view (*.ascx). Also add the [Themed] attribute to the top of the HomeController class just like the normal Orchard walk through shows it. Step 6 – Add Routes.cs. Notice I’ve given an area name of “Orchard.Widget” on lines 26 and 33. Step 7 – Add MainMenu.cs. This will make sure that an item appears in the main menu called “Widget” which points to the module. 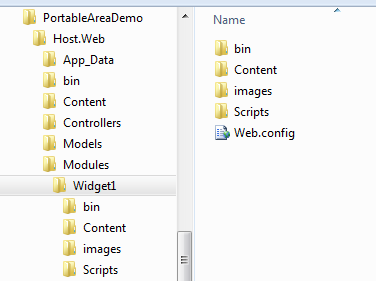 Step 8 – Clean up web.config. 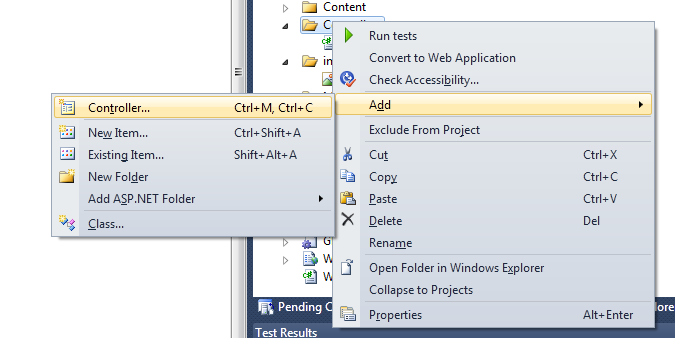 By default Visual Studio adds numerous sections to the web.config. The sections that can be removed are: appSettings, connectionStrings, authentication, membership, profile, and roleManager. Step 9 – Delete Global.asax. This project will ultimately be running from inside the Orchard host so this “sub-site” should not have its own Global.asax. Embedded resources are stored in a case-sensitive way in .NET assemblies and the existing embedded view engine inside MvcContrib already took this into account. Obviously, we’d want the same case sensitivity handling to be taken into account for any embedded resource so my job consisted of 1) adding the Embedded Resource Controller, and 2) a little refactor to extract the logic that deals with embedded resources so that the embedded view engine and the embedded resource controller could both leverage it and, therefore, keep the code DRY. This post will describe a walkthrough of using the embedded resource controller in your portable areas to include the scenarios outlined above. 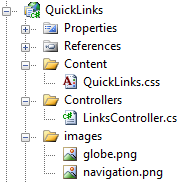 I will build a trivial “Quick Links” widget to illustrate the concepts. First, notice that I can specify any route I want (e.g., “quicklinks/resources/…”). Second, notice that I need to include the “MvcContrib.PortableAreas” namespace as the fourth parameter so that the framework is able to find the EmbeddedResourceController at runtime. Other than that, the portable area registration remains unchanged. The Url.Resource() method is now included in MvcContrib as well. Make sure you import the “MvcContrib” namespace in your views. On line 3 we’re able to refer to the url for the background property. The complete code for this post is now included in the Portable Areas sample solution in the latest MvcContrib source code. You can get the latest code now. 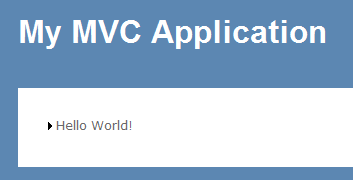 Portable Areas open up exciting new possibilities for MVC development! Thanks to everyone who attended my C# 4.0 presentation this weekend at Philly.NET Code Camp. The code samples and PowerPoint can be downloaded here: C# 4 New Features. The video replay URL is here: C# 4 video replay. This Saturday I will be at the Philly.NET Code Camp presenting C# 4.0. The code camp is currently registered to capacity (800 attendees) but you will be able to view certain presentations on a Live Meeting simulcast (and later on Channel 9). You can tune it at 3:30PM Eastern time to view my presentation. The attendee URL is here. 2:  <img src="<%: Url.Content("~/images/arrow.gif") %>" /> Hello World! The point is that there needs to be careful consideration for *any* scenario that links to an external file such as an image, *.css, *.js, etc. 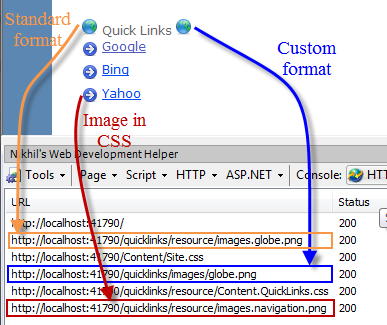 In the example shown above, it uses the Url.Content() method to convert to a relative path. But this method won’t necessary work depending on how you deploy your portable area. One approach to address this issue is to build your portable area project with MSDeploy/WebDeploy so that it is packaged properly before incorporating into the host application. Since we’re just using our own Url.AreaContent() rather than the built-in Url.Content(), this solution works for images, *.css, *.js, or any externally referenced files. Additionally, any images referenced inside a css file will work provided it’s a relative reference and not an absolute reference. An alternative to this approach is to build the static file into the assembly as embedded resources themselves. I’ll explore this in another post (linked at the top). Being able to have the normal tooling experience we’ve come to expect from Visual Studio makes creating portable areas quite simple. This even allows us to do things like creating a project template such as “MVC Portable Area Web Application” that would come pre-configured with routes set up in the PortableAreaRegistration and no Global.asax file.